Epic sand dunes tower as tall as skyscrapers. Sandhill cranes can be seen in the spring and fall. And at least six species of insects found there — including the beautiful Great Sand Dunes tiger beetle — exist nowhere else in the world. Under a new Trump Administration proposal, oil and gas companies could begin drilling on up to 18,000 acres near this national treasure — and next to the Sangre de Cristo Wilderness Area. Noise and disruption from drilling operations can disrupt and destroy wildlife habitat. And drilling raises the very real prospect of a toxic spill in this vital watershed. Industrialize our beautiful public lands — and the home of six species found nowhere else on the planet — for the sake of fossil fuel companies? Threaten local water supplies with waste from drilling and fracking operations? Destroy our public lands just to double down on dirty fossil fuels that can cause toxic spills and make climate change worse? 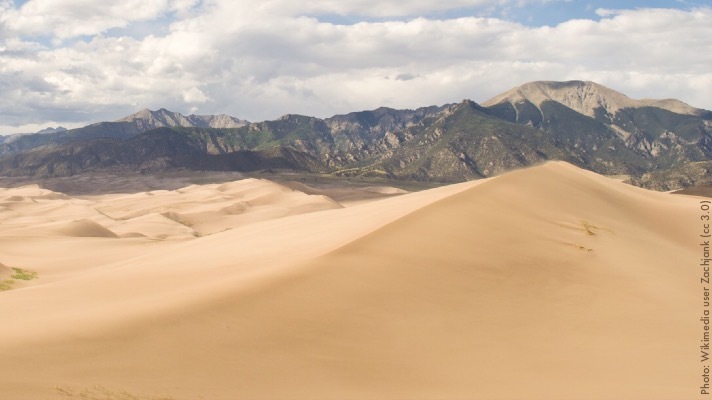 The answer is clear: we owe it to future generations to be responsible stewards of irreplaceable places like Great Sand Dunes National Park and the wild areas nearby. Now we need to keep the concerns of nature lovers front-and-center as the agency decides its next steps for this unique wild place. Please sign our petition to protect this special place now. 1. Alana Miller, “Oil and gas industry is coming for Colorado’s sand dunes,” CNN, June 25, 2018. 2. Zach Fitzner, “The controversy over drilling for oil in the Sangre de Cristos,” Earth.com, June 27, 2018. 3. Marianne Goodland, “BLM delays lease-sale of land for drilling oil and gas near Great Sand Dunes National Park and Preserve,” The Colorado Springs Gazette, July 10, 2018.